We have reached the lands of the Gods, gazed upon their infinite knowledge, and returned with another enlightening podcast. This week, Scott and I eagerly delve into God of War III, the final installment (maybe) in the epic Kratos trilogy. Join us this week to discuss the game's new features, the design of Olympus, fun with fleeces, over-the-top aesthetics, and the brilliance of thematic consistency. Comments are encouraged and appreciated. - How well does God of War III carry the torch from the first two titles in the series? - Should this game be the last in the franchise? Is this content all tapped out? - What are your thoughts on the game over all? I've surely enjoyed the God of War games so far(haven't played this one yet) but I always found the Devil May Cry and especially the Ninja Gaiden series to be far superior in terms of combat mechanics. Have you played those, especially Scott, since you seem to be the systems first guy here. I was late to the whole ps2/xbox generation, so I missed out on the DMC and Ninja Gaiden games. Which titles would you recommend as your favorites? Hopefully I get around to playing Bayonetta one of these days. I get the sense there is still a marked Western vs. Japan design philosophy. God of War seems to channel things like Battletoads whereas Ninja Gaiden is going in another direction. Yeah, Bayonetta is on my list as well. I played the original Ninja Gaiden on Xbox, but from what I've heard the Sigma(1) edition on PS3 is a pretty good port. Whether on Xbox or PS3, I'd definitly play the first NG first, the second one goes in a slightly different direction, actually it's become more God of Wary in a way, which turned a lot of people of. Way more enemies, bloody as hell(they removed that for the Sigma 2 Version for PS3), a lot more chaotic, faster paced etc. So if you really want to see the genre from a different point of view than the God of War one, play the first one. As for DMC you might as well want to try out the first one on PS2, it basically sets the standards for the rest of the series. DMC2 was a huge letdown, DMC3 (made by the same guys that did the first one) reestablished the series again (however it was really hard), DMC4 softened up the DMC formula a bit (you can clearly see that they adopted some western design philosophy things) at the same time it managed to conserve a lot of the characteristic feel of the series. Hi! Great to know that you guys are God of War fans too! I also like the beginning part of the Poseidon fight, it was so exciting and new type of experience, like riding a titan! I gave me a big impact, too big! 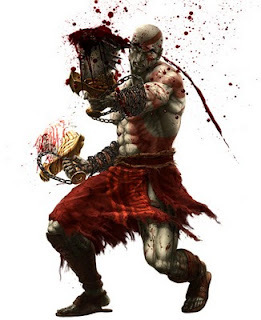 There was a new experience too, which you kill Poseidon in the victim view but not the Kratos himself. I was panic at the moment the view change. Because you had the Icarus's wing, flying through the hell and Olympus was a new experience since you are flying in a narrow passage. The weapon are also new, like the Claws of Hades, I like that weapon VERY MUCH!!! It doesn't like Blade of Exile but much more lighter and faster than it(summoning souls was the work of this weapon too). I like the way they brought in others Greek mythology characters like Hercules, Icarus and others more. I can see the team made a big change from GoW to GoW3, no matter by visual or mechanics. That's great for the players for a new experience then before.